COEXIST Acrylic on stretched canvas. Measures 30″ H x 30″W x .75″ Sides are painted to match the theme and hanging hardware is attached so this baby is ready to hang immediately! Did you know there are rivalries between vineyards? There are rivalries between wine regions throughout the world. 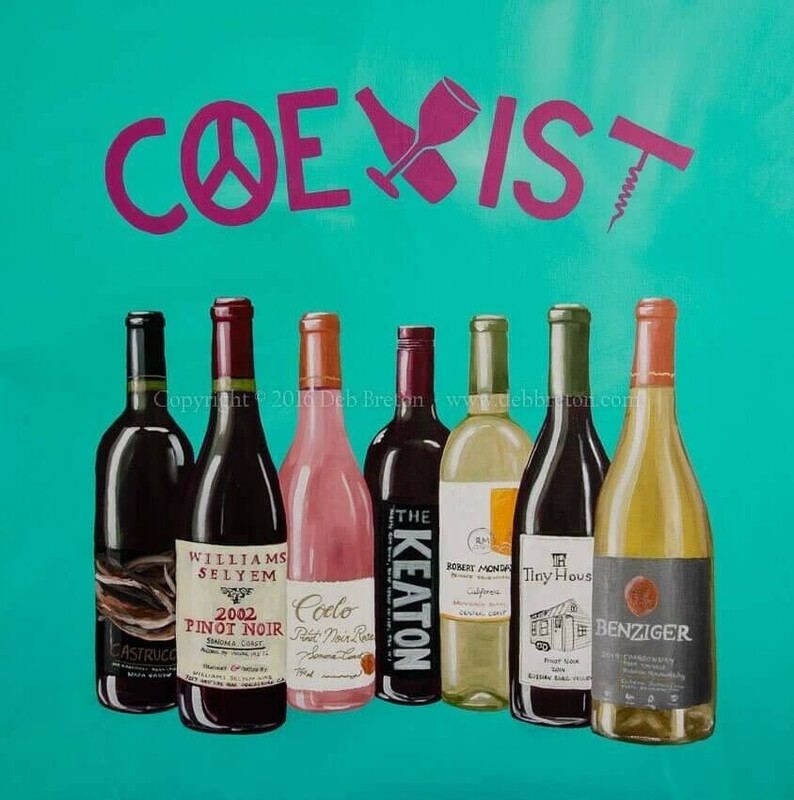 Even here in the U.S., there are rivalries between east and west coast wines! Closer to home where I live here in Sonoma County, there are rivalries between Napa and Sonoma wineries! All I can say is; why can’t we all get along?!!! Oh sure, some days a good Chardonnay or Pouilly Fuissé is in order, while other days, we long for a full rich Pinot Noir. Still other days, a table red will do, thank you. Hell, I even threw in Diane Keaton’s robust red wine: THE KEATON, which I would love to try one day just for the hell of it. Yes, even on ICE. Yes, in a TUMBLER too! There, I said it!!! I’m not a wine snob. I enjoy a good wine on occasion, but I’m just as happy with a local Cabernet Sauvignon too! By the way, I tweeted to Diane Keaton asking her about the color of the wine bottle. It’s probably green, but then knowing her fondness for all things black and white – I’m feeling like the bottle may be black. Who knows? I never heard back from her (silly right?) Pretty sure she has all the time in the world to answer me back 🙂 Tried to score on a bottle here, but apparently it’s only distributed down in Southern California. I have been so psyched about these wine paintings that I can hardly sleep at night. If you’re an artist – you probably paint in your sleep all the time like I do, but this is beyond that! I literally am working on these paintings day and night and it feels great to be so impassioned about this series. If you’ve read my blog, then you already know just how much FUN I’ve had with THE wine series. This one is no exception! Yes, I danced a lot while painting this one too, except for when it came time to paint the wine labels – of course…To top it off, I finish each painting with a glass of wine and a toast. Wishing love, joy and good intentions to the collector of this piece!